The series Empire of Dust by French artist Amélie Labourdette explores the many layers of human history through the social and aesthetic characteristics of a landscape pock-marked by ecomostri: unfinished concrete giants erected in the hollow of a valley, or on the side of a hill. 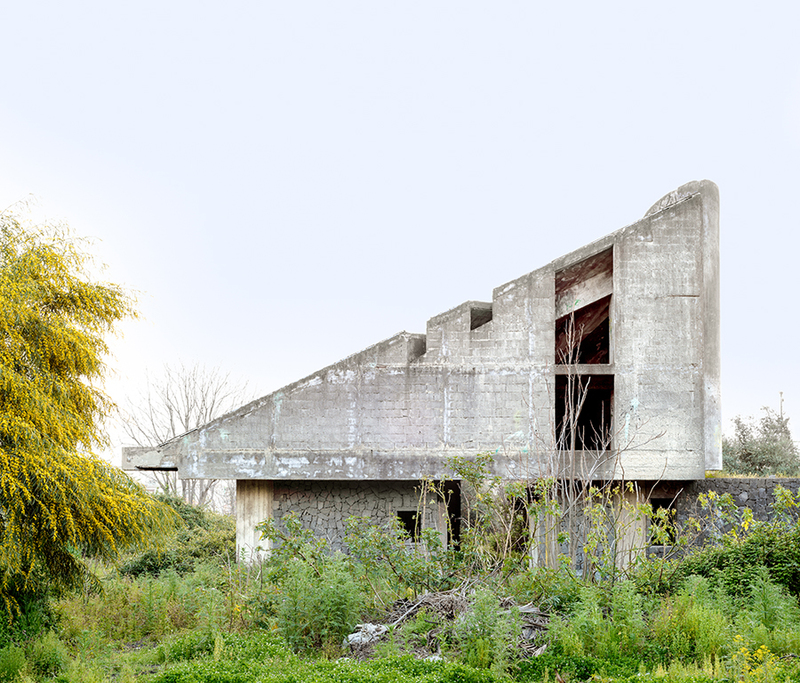 Winner of the 2016 Sony Photography Award in the Architecture category, the artist presents her first solo exhibition at the Galerie Thierry Bigaignon in Paris. Empire of Dust reveals Italy as a land of ecomostri. This neologism, synonymous with offensive to the eye, or inadequacy to the landscape, designates a plurality of situations referring to unfinished constructions – hotels, motorway sections, bridges, isolated villas, even entire villages. Some buildings are public, others are private. Some are illegal, others remain incomplete due to a lack of funds, or are simply a cloak for money laundering.. Beyond their shape and statuary design, these structures reveal the realities that permeate the economy and society of Southern Italy: money laundering, embezzlement, mafia activity, lack of consideration for the common good, and so on. Concrete skeletons of unfinished buildings, of abandoned major projects…recurring patterns of our time affected by socio-economic upheavals, become, through their incompleteness, interstitial spaces of indeterminacy, and despite their imposing dimensions, we almost forget the purpose for which they were initially designed. These indefinite forms, somewhere between future ruins and potential sculptures, paint the outline of a strange present between dystopia and utopia, the revival of history building on a new poetic area, over which hovers the specter of the end of a certain kind of world. By questioning the notion of territory to be built, domesticated or artistically redefined, Amélie Labourdette seeks to reveal the temporality and many-layered identity of a landscape. Her photographic projects are set up on the basis of an existing state of things and use landscape as a reference to both our individual and collective memory. The dense, opaque light and the absence of shadow is reminiscent of photography from the School of Düsseldorf, of the minimalist sculptures of the 60s, of the monumental interventions of Land Art, but also of the ruins in German romantic paintings and the “forward-looking ruins” of science-fiction novels, where nature triumphs over human constructions. For Amélie Labourdette, these “ruins” are “holes in reality”, portals through which to access time itself: facing them, we become archaeologists of our time, and, like the astronaut in Planet of the Apes, take a look back at both our present, and our future.